Whipped together a pretty yumtastic spring meal tonight, using mostly cupboard and fridge staples but wih some delicious fresh seasonal goodies. Warning–these measurements are super approximate! Heat some EVOO over medium heat, tadd rice and quinoa, and toss to coat. Toast for about 2 minutes. Add a cup veggie broth and stir fairly continuously. Bring the broth to a simmer and add remaining broth and milk a cup at a time as it gets absorbed into the rice (don’t cover). Continue to add liquid until rice is cooked through and consistency is creamy and thick. This will take a good while–give it good attention. Meanwhile, boil a medium sized lot of water. Blanch the stems of 1/3 of the asparagus, scoop out of the water, and purée in Magic Bullet or food processor (add some pesto if moisture would ease the process). Plop the purée into the now-coming-together risotto, along with all the pesto. Return water to boiling and blanch the rest of the asparagus. 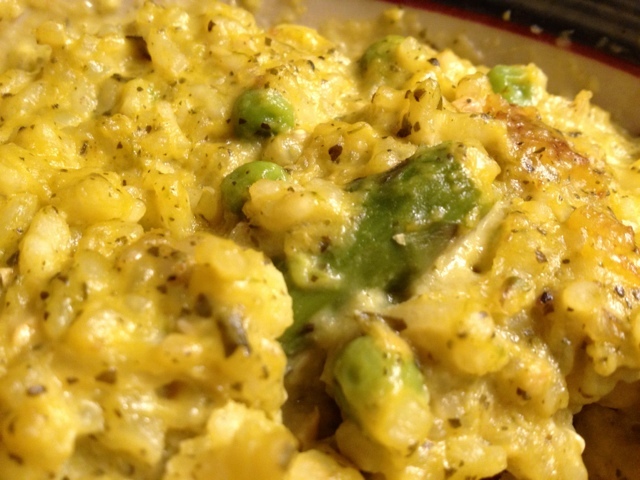 Add peas and asparagus to risotto. Add Parmesan and incorporate well. Heck YES dudes! I served this with a green salad (Butterhead and some red variety) with paper-thin radishes, almond slices, diced fresh chives, and this delightful dressing: 1 lemon’s zest, 1 lemon’s juice, a good dollop of stoneground mustard, drizzle honey, EVOO, salt & pepper. Very light and bright and the perfect accompaniment to rich risotto!